Gathering your ancestors’ vital records (birth-marriage-death) is very important. These are primary sources, usually created at the time the event happened. Yet, many times, you might over look some interesting or important information on such documents. In honor of my own 33rd wedding anniversary, let us look at marriage records to see what is often overlooked on such documents. Of course, the bride’s and groom’s full names are listed. 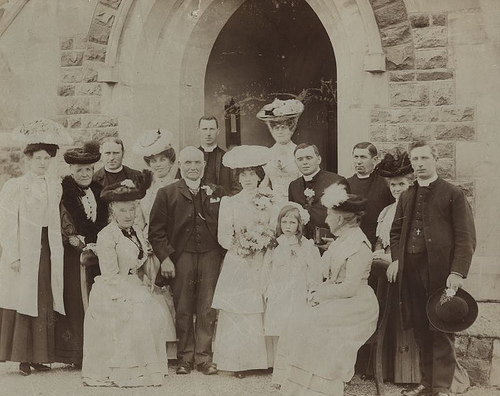 If you didn’t have the bride’s or groom’s middle name, you might find it on a marriage record. Remember, besides the official recorded marriage license there could be a wedding guest book, a listing in a family Bible, and a listing of the wedding in the local newspaper, all which also be checked. Examine the marriage record for who performed the wedding. If a clergyman, that would be clue of any church records of that wedding that should also be checked. Also church ministers, pastors and priests can be researched. Church and synagogue records (many going back to the 1800s) might have more details that would not be on an official government record. If you see the letters ‘J.P.’ that means the couple was married by a Justice of the Peace. 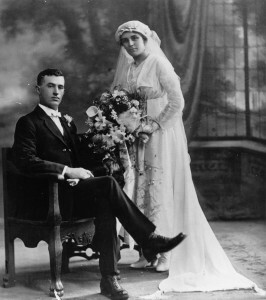 It was a traditional custom in the 1700s and to the mid-1800s to have a marriage bond established before a wedding, usually done by a family member. 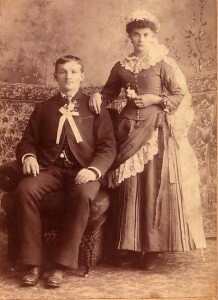 When a couple became engaged, the future groom went to the local courthouse with a bondsman (often the father, uncle or brother of the prospective bride), and posted a bond (a sum of money) indicating his intention to marry the woman. It was done as proof there was no moral or legal reason why the couple could not be married (such as too young) and it also affirmed that the groom would not change his mind. The bond money would be returned if after 1 to 2 years no legal problems arose. So if a bondman was listed, you would need to investigate that name. Those other individuals who signed the marriage certificate were the witnesses to the wedding and many times were relatives. Note even if the last name is not recognizable, it might be a sister of the bride or groom who was married, and now you have their married name. One of the best items to find on a wedding certificate are the signatures of the bride and groom. However, remember not everyone, especially in the 1700s and 1800s knew how to write their name. Many times there was only an ‘X’ written by the bridge or groom and the name written out by someone else. Photos: Bride and groom in 1880s – brides usually wore their best dress, not necessarily a new white dress then; a couple’s wedding portrait in 1910; and wedding group & guests in 1906. NOTE – brides stood to show off their dress.